MOUNT DORA – The City of Mount Dora Public Arts Commission at their regularly scheduled meeting on September 27, 2011, selected another spectacular art piece to be placed in the upcoming Community Building Sculpture Garden. 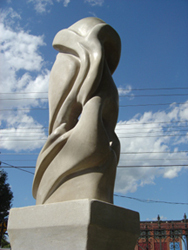 Artist Carl Wright created a beautiful abstract lime stone sculpture entitled "Eihei" (Translation: Guardian or Sentinel). 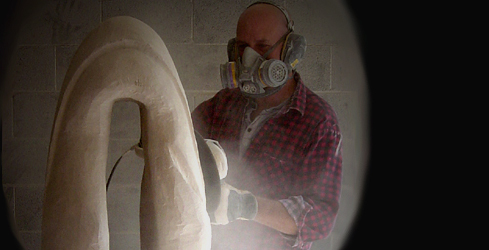 Mr. Wright's studio is located in Martinsburg, West Virginia. Additional information on the artist and his work can be found at www.wsggallery.com . Shawn McNalis, Chair of the Commission, stated “After reviewing the submissions, the Commission liked the ethereal feel of Wright’s stone carving and felt that it’s rounded shape would provide a nice compliment to Doug Hays’ more angular metal sculpture named “Council”. Our intention for this sculpture garden is to represent a variety of artistic styles. We appreciate the McLin Foundation for making the purchase of this sculpture possible at a time when there is not much money for the arts”. The new sculpture was made possible by a recent grant contribution from the CHARLES B. AND MARY M. MCLIN FOUNDATION. The McLin Foundation’s generosity will help forward the mission to make Mount Dora a City that celebrates the arts. The City's Public Arts Commission members acknowledge the approved artists that have registered. The City of Mount Dora is currently soliciting professional artists for the purpose of creating a database of qualified artists that will be utilized in the commissioning of public art by the Public Arts Commission. Mr. Wright was selected as a registered artist during the recent Call for Artist process. The database will also be a resource for private developers in selecting capable artists to create public art for private developments to meet the requirements of Public Art in Mount Dora. For more information and an application on how to become a registered artist with the City of Mount Dora, please visit www.cityofmountdora.com and link to "Boards and Committee" (Public Arts Commission).